Cave and karst systems are unique environments that occur throughout the Appalachians. They provide habitat for a diverse array of species and are an important source of domestic water supply for Appalachian communities. However, a lack of classification and mapping information on these ecosystems creates a significant barrier to conservation. In order to develop and deliver landscape-level planning tools, it is essential to create an Appalachian-wide map depicting where cave and karst habitats and resources occur across the landscape. Despite other efforts to classify and map karst systems of the United States, the more fine-scale classification and mapping data for biodiversity and resource management were still needed. Researchers from an array of organizations and institutions were funded by the Appalachian LCC to gather and analyze data on caves and karst region wide. The project first summarized pre-existing efforts to collect and present karst resource information and developed an appropriate classification system for karst habitats within Appalachia. From this foundational work, researchers next produced a series of deliverables, including data tables, geospatial information layers, and maps. The maps and other products provide a comprehensive overview of available data for examining relationships between environmental factors and biological diversity and distribution within karst areas of the Appalachian LCC. A visual survey compiles all this information and guides users to what this project has accomplished, as well as new questions and results that would interest end-users. 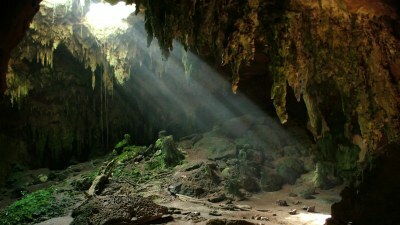 This vital spatial information on the physical and biological resources of cave and karst systems – compiled by researchers at American University, U.S. Geological Survey, University of the South, University of Illinois, and University of Florida - is now being incorporated into landscape conservation planning for the region. View a video presentation by Dr. David Culver of American University, which provides an overview of the unique cave and karst ecosystems of the Appalachians as well as the research and decision support tools created from this Appalachian LCC funded project.